James Ruddell was born August 20, 1758. He died in Boone, Kentucky around 1840, when he was 81 years old. In the book John Ruddell of Shenandoah by Harold Smutz, James Ruddell is referred to as "one of the garrison at Ruddell's Station when it was captured in 1780, (during the American Revolution.) He stated in his application that in 1777 he served six months in the Shenandoah militia under Col. Abraham Byrd: 1779-80 he served in the KY Co., VA militia under Capt. Isaac Ruddell, was captured 24, June 1780 and remained a prisoner of war until the fall of 1783, and later that fall returned to KY and became a resident of Fayette County. Children were listed in the Haynes Family Bible." James married Jane MULHERIN, daughter of Charles MULHERIN Jr. (1730-1789.) Jane was born January 25, 1761 in Lancaster County, Pennsylvania. Jane had previously married Cornelius Ruddell, son of Captain Isaac Ruddell. Cornelius was killed by Natives, the widow Jane Mulherin Ruddell subsequently married Cornelius' first cousin, James Ruddell, son of Archibald and Elizabeth (Beggs) Ruddell. Jane died around 1834 and 1835. Some records mistakently indicate that she died in 1833, and list the cause as Cholera. There were Cholera outbreaks in Cincinatti (upstream from Boone Co. KY,) in the summer of 1834 and in October of 1834. It is not clear whether Jane was effected by any of these outbreaks, or the exact circumstances of her death. court before the Honorable Henry Brown _____ Judge of the Boone Circuit Court, now sitting, being a court of record, James Ruddell, a resident of Boone County and State of Kentucky aged seventy-five years (next August) who being first duly sworn according to law, doth on his oath make the following declaration in order to obtain the benefit of the Act of Congress passed June 7, 1832.
following named officers and served as herein stated. company of riflemen under Captain Rader sometime in the year 1777, the month and day of the month not recollected, for six months marched from Shenandoah County to Pittsburgh, from thence to Wheeling, Colonel Bird had command of the Regiment, his General's name was Hand?, the served the whole six months out and was discharged at Wheeling, but owing to the length of time and subsequent misfortunes during the Revolution he has long since lost the paper containing it. under the immediate command of Captain Isaac Ruddell, John Bowman was the Colonel who commanded. 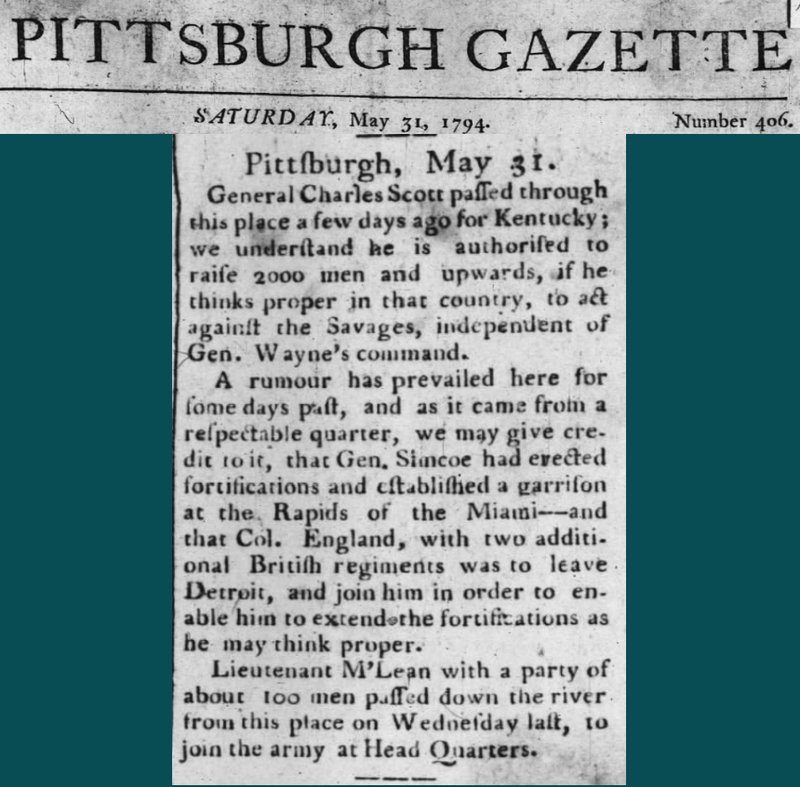 He served in Captain Ruddell's Company in Kentucky until about the 24th day of June 1780, at which time the British and Indians made an attack on Ruddell's Station, where the troops then were. 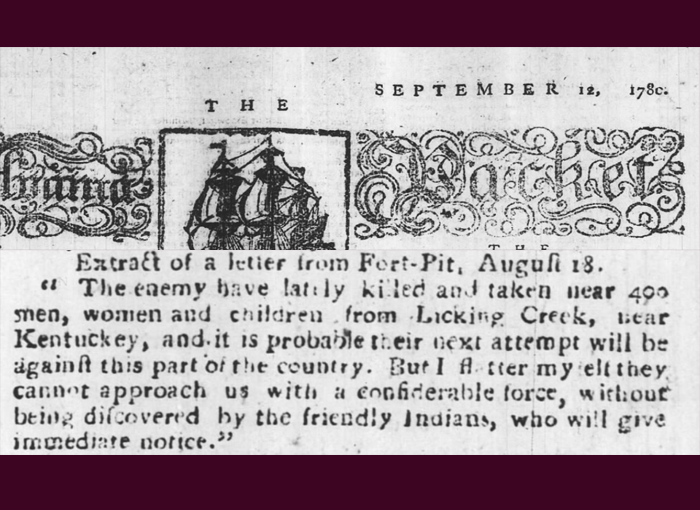 The Station was taken by the British and Indians, and he became a prisoner of war - he was taken by the Indians to Detroit and there given up to the British, and was through Canada, was a prisoner to them more than two years and six months. At the conclusion of the war and when peace was restored, he was returned to his fellow citizens of Virginia. He afterward moved to Kentucky in the fall of 1783 and settled in the then County of Fayette; in the year 1814 he moved to Boone County where he has resided ever since. Pittsburgh, he knew a Regular Officer named Gipson who was the Colonel and had command of that place. service whose testimony he can procure, who can testify to his service. acquainted with James Ruddell, who has sworn to and subscribed the above declaration that we believe him to be seventy-five years of age (next August), that is is reputed and believed in the neighborhood where he resides to have been a soldier of the Revolution, and that we concur in that opinion. Sworn and subscribed the day and year aforesaid. 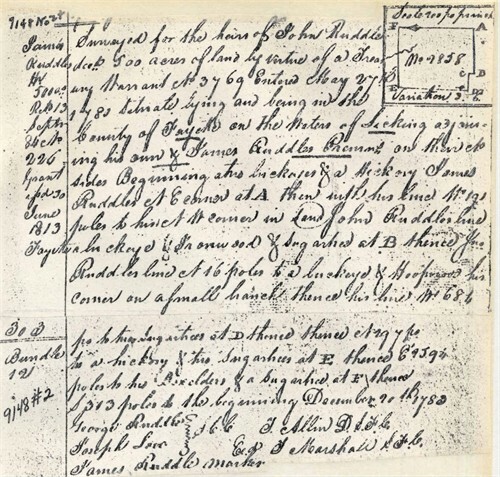 Marriage between James Ruddell and Jane (Mulherin) Ruddell. A property deed from 1834, shows a Jenny Ruddell involved in property transactions. year 1783. He knew and hunted this fork of Mill creek called the south fork. The other principal fork the north fork. And he believes they were generally known after his return as aforesaid by those names. by complts What kind of oak do you call the trees which this corner is made? Ann. A large red oak & white oak & black oak The black oak & white oak growing together at the root and now blown up & a buckeye marked SM marked also as a corner. Question by defts. Did you ever see these corner trees before today? Ann. I did not. Question by same Whether or not could you tell the kind of trees as well as if they were standing considering their decayed state. Ann. The large red oak and white oak are known to me but the black oak is not. And further this deponent saith not. Jas Ruddle." Note the above William E. Boswell, is most likely the same Lt. Col. Boswell, who led James' sons, Charles & George to Fort Meigs, in March of 1813. This letter shows that Thomas Carneal's son, Thomas Jr., was a soldier with James' cousin Abraham in the War of 1812. "This day at twelve o'clock we arrived at this place, after a rapid journey of forty miles per day. We had heard on the road that Gen. Harrison was about to march to Detroit, and we wished if possible to join him before he set out. After we had passed Piqua about 6 miles, we met Capt. Trotter, of the Lexington dragoons, who informed us that Gen. Harrison would set out with all his army for Detroit in three weeks; that he ahd ordered Capt. Garrard's troop of horse, from their march towards fort Defiance, back to this place to recruit their horses to fight the British in Canada; and that during those three weeks the mounted volunteers were to scour the frontier towards the head waters of the Wabash, and destroy all the Indian towns in that quarter. But an unexpected event, has for a time thwarted all these designs. A part of the army, composed of three regiments commanded by Col. Allen, Scott, and Lewis also the regulars under Col. Wells, and Capt. Garrard's dragoons, all under the command of General Winchester, were on their march to fort Defiance, cutting hteir road as they went, and when they arrived within about 4 miles of the fort, they were surrounded by so large a body of Indians, that they were unable to proceed backwards or forwards. Yesterday about two o'clock PM and express arrived to Gen. Harrison, from Gen. Winchester, stating that the detachment under his command was entirely surrounded by a very large number of Indians; that they had been compelled to fortify their camp, by making a breast work of logs on all sides of them. The breast-work is about 5 ft high. The express stated that in consequence of the Indians having surrounded them, they had received no provisions for several days; that they had nothing but beeves, adn but few of them. And he desired immediate relief, lest his troops should be either starved to death or cut to pieces by the Indians. Two hours after the express came Gen. Harrison with his whole army marched to his relief. The express was brought by Thomas D. CARNEAL of Frankfort and Abraham RUDDELL. They say that from the trails of the the Indians they must be equal to the army under Gen. Winchester (which is composed of two thousand men.) They further state that htey saw the tracks of four or five wagons or carriages by which they suppose the Indians have cannon with them. They further state that five of the spies belonging to Allen's regiment were killed by the Indians and two wounded. The army under Gen. Harrison has advanced about 25 miles from this place. Capt. Trimble and myself shall set out tomorrow morning at daylight with 5 or 6 hundred mounted riflemen and infantry from the state of Ohio to join the army. We expect to have a battle the day after tomorrow, which will be the day on which we expect to reach fort Defiance. N.B. Richard M. Johnson commands the regiment of mounted volunteers from Kentucky.